How much time do you spend searching for the right hashtags for your Instagram posts and tapping them, one-by-one, into your phone screen? Smart Instagram marketers already save time by copying and pasting lists of their most used hashtags from notes on their phone. With Tailwind for Instagram you can now save as many Hashtag Lists as you'd like right in our app and add them to your Instagram posts with one quick click, either from desktop or your phone. What a time saver! No more looking through phone notes or going into a different app to find your hashtags. See our Knowledge Base Article for how to add a "Hashtag Lists in Tailwind's Mobile iOS app"
2. Click the "Hashtag" button to open the Hashtag List creator and the "+" button to add a new Hashtag list. The limit of hashtags per post is 30 according to Instagram. 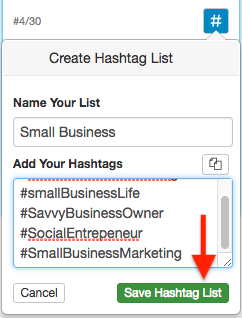 Helpful Tips: Make lists of top hashtags for each type of content you post (e.g. fashion, food, exercise). 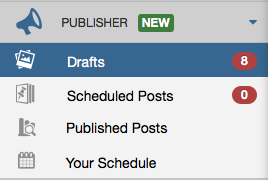 Or try saving pre-save formatting, contest rules, or stock text for campaigns! 3. Make sure to click the "Save Hashtag List" button on the list to keep it! 4. Add a list of Hashtags to an Instagram post in one quick click of the Hashtag Button! Learn more from our blog post, Hashtags Lists for Instagram.